While recently walking in the ultra ritzy Ocean Ave, Carmel, California I saw this sign on a gateway. Yes, I always notice strange and interesting names even on a mini vacation day. What I especially like is when they are paired with a really nice tagline, slogan, motto or promo sentence. However, when I stopped to read this one, my first thought was “What a shame. Great story, but didn’t they check the grammar before having it made in bronze?” Then I saw the author’s name and did a double take. Ralph Waldo Emerson is surely better at English than me. So I studied it some more until I realized it really is correct English grammar. But oh how awkward. are the friends who frequent it." 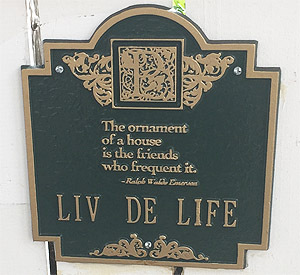 As for name Liv De Life. A simple way to add some class to your humble adobe trying to keep up with the rich and famous. Why not?